I’m always drawn to local food markets. The Foodie in me is always intrigued by foods I’ve never before seen, and there’s no better way to get a candid look at everyday people than in a market. 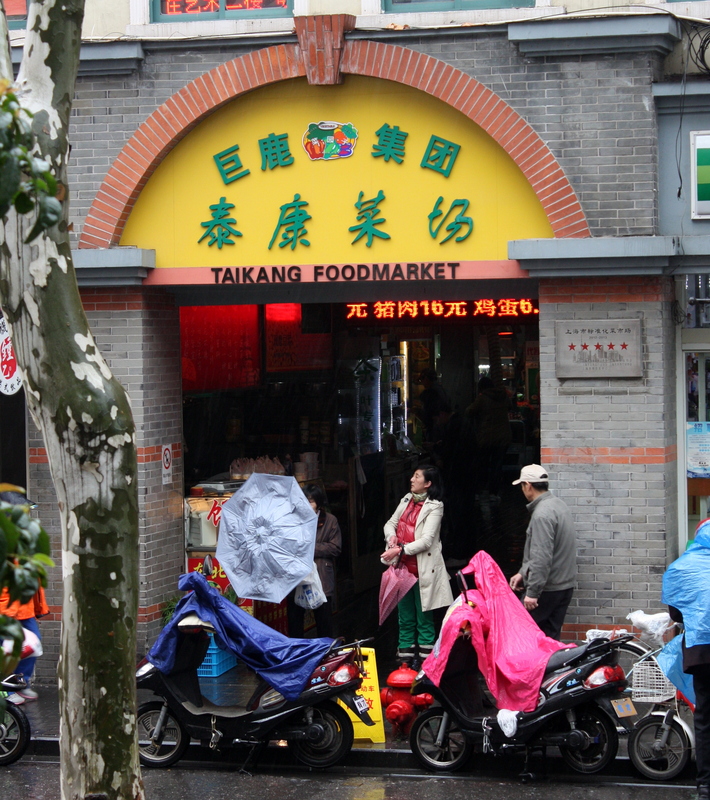 The Taikang Food Market in the French Concession satisfies on both counts. 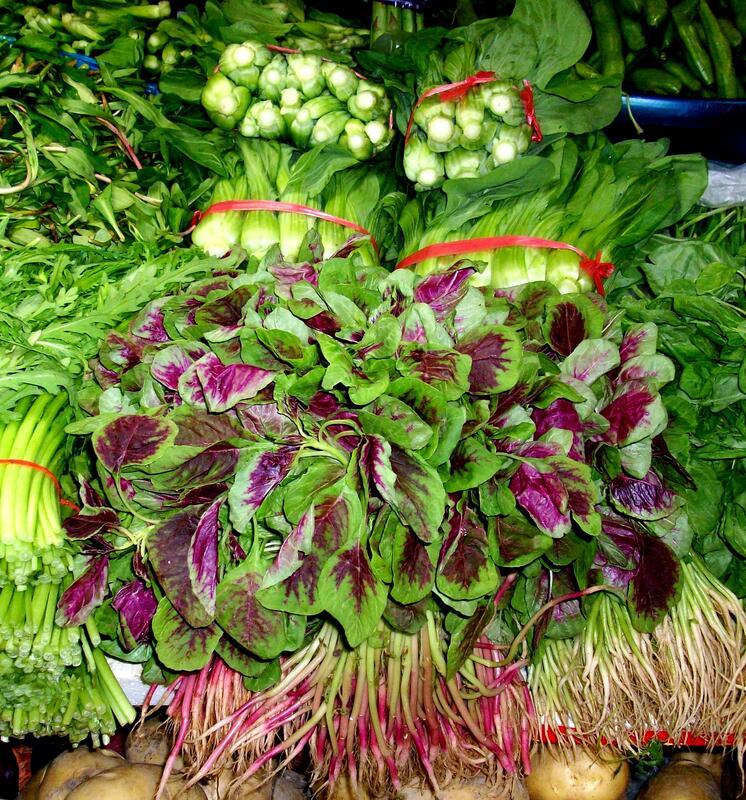 While I’m no stranger to Chinese food, this market is chock full of never-before-seen produce and seafood. It doesn’t hurt that on the day of this visit it’s also mercifully devoid of tourists. Just inside, a vendor behind a deli counter is selling ready-to eat foods, but beyond her most of the booths are dedicated to fresh foods. Brightly-lit produce stands up to the closest inspection. 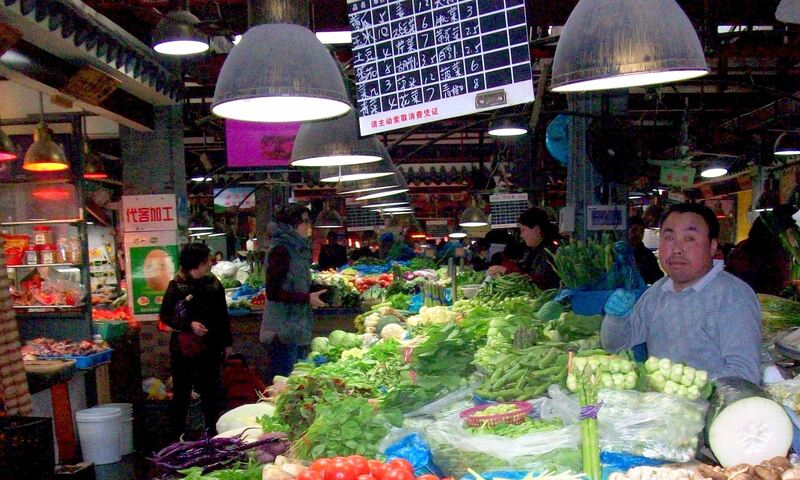 The floors and tiled walls of the Taikang Market are well-worn and the market itself is dimly-lit, but the food stalls are immaculate. Carefully manicured fresh produce is vibrant beneath pools of low-hanging lights. This place would be the envy of the Stateside Whole Foods Market. Most of the vendors are middle-aged or older, and there’s a sense that they and their families have been working their booth for a lifetime, if not for generations. Like many Chinese their age, they’re emphatically camera-shy. Nothing goes to waste here. The Chinese put great emphasis on freshness, so it’s not all that surprising to see seafood still alive and kicking in watery bins. I do a double-take, though, at what looks like sea kelp and snakes writhing in side-by-side bins. 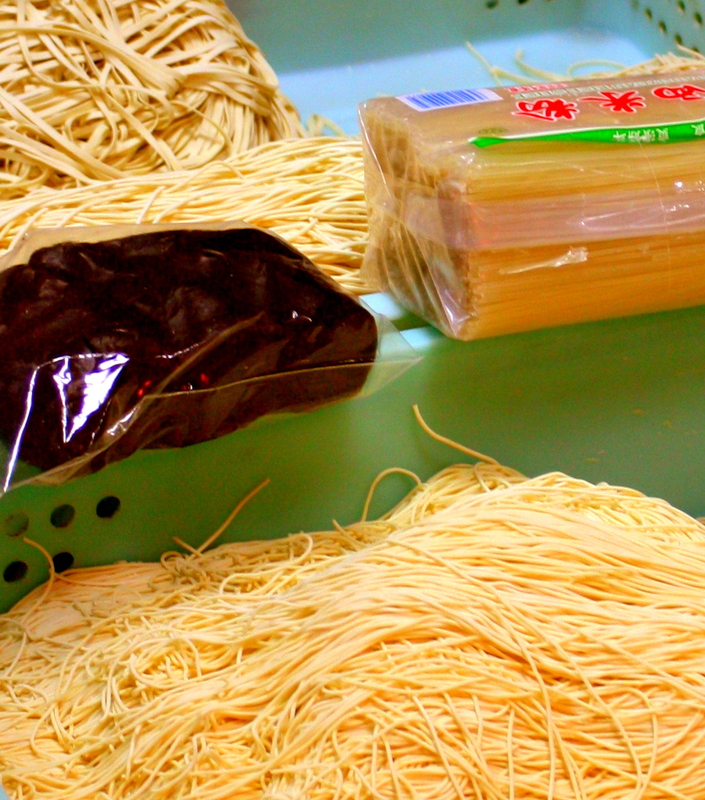 Rice noodles, rice cakes, and rice wine are only a few ways that rice is consumed. In this nation with so many mouths to feed, there’s little waste. 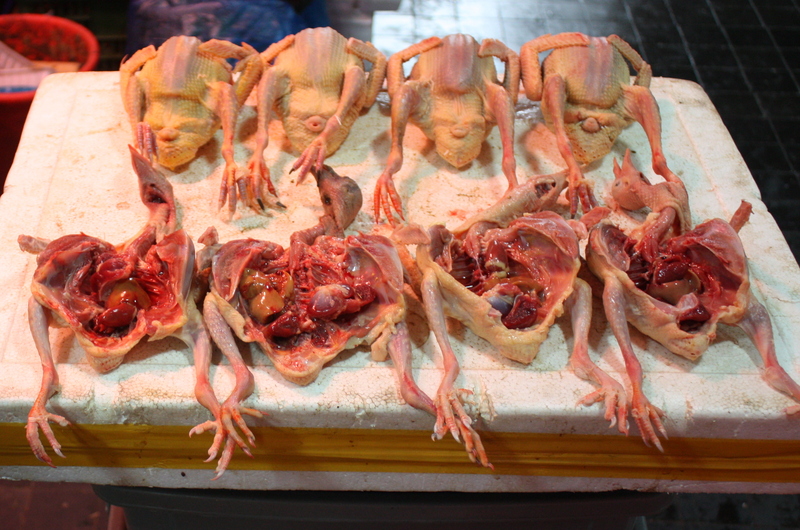 Poultry is sliced open end-to-end to display innards, and both head and feet are still attached. Chicken feet are considered a delicacy in China, so much so that they can actually cost more per kilo than chicken breasts. 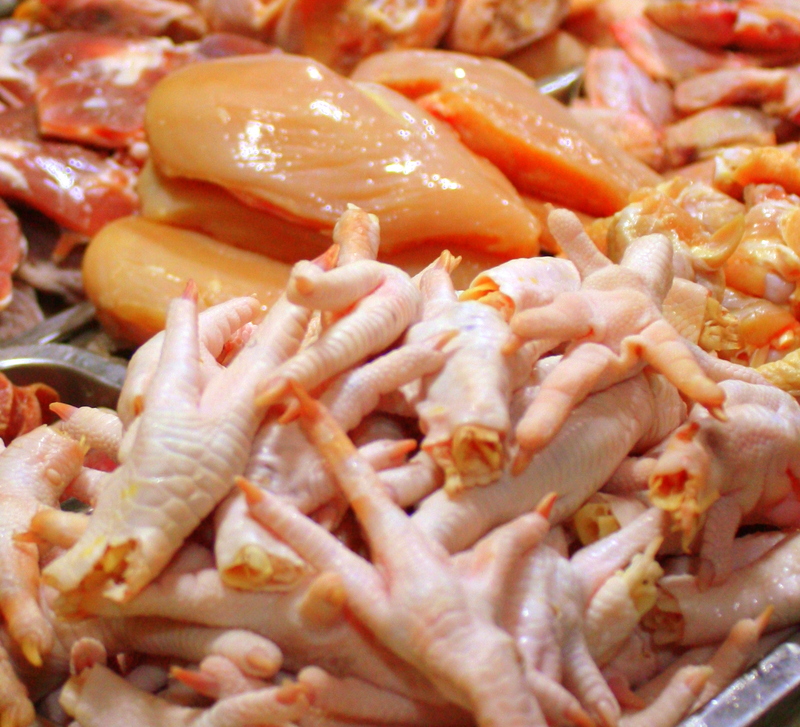 Demand for feet is so high that China now imports them from the U.S.
Chicken feet are no more about meat than are buffalo wings. The appeal is in the preparation, which includes deep-frying or steaming them until they turn almost to gelatin, and simmering them in flavorful sauces. More chicken feet than breasts! 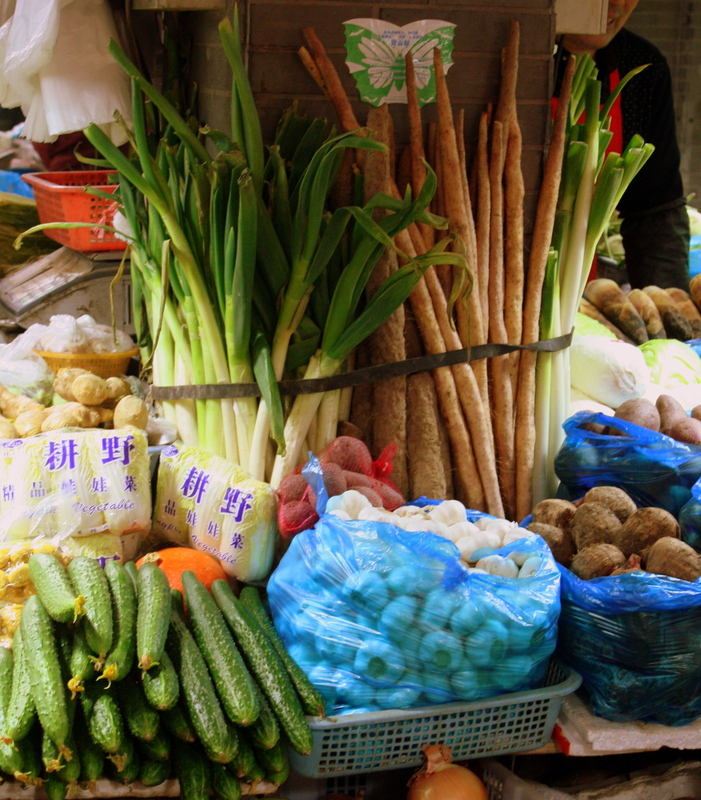 There are Chinese eggplants well over a foot long and “long bean” string beans even longer. There are squashes and tropical fruits in exotic shapes and colors, and dragon fruit soon becomes one of my breakfast staples. 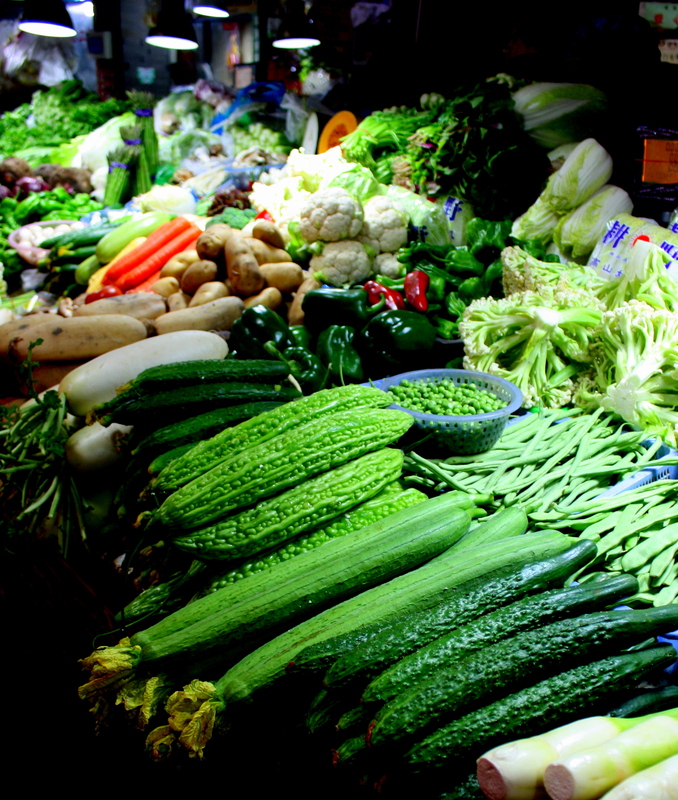 The produce is a feast for the eyes. 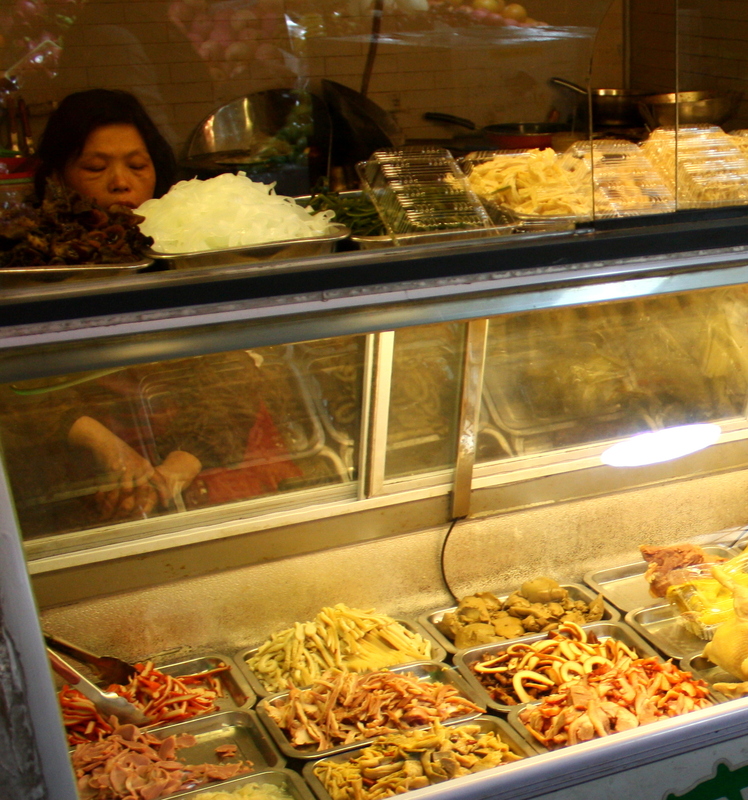 One booth displays freshly made rice noodles as varied in size and shape as Italian pasta. Rice is the primary staple grain in southern China. In the drier and more temperate north, it’s wheat. 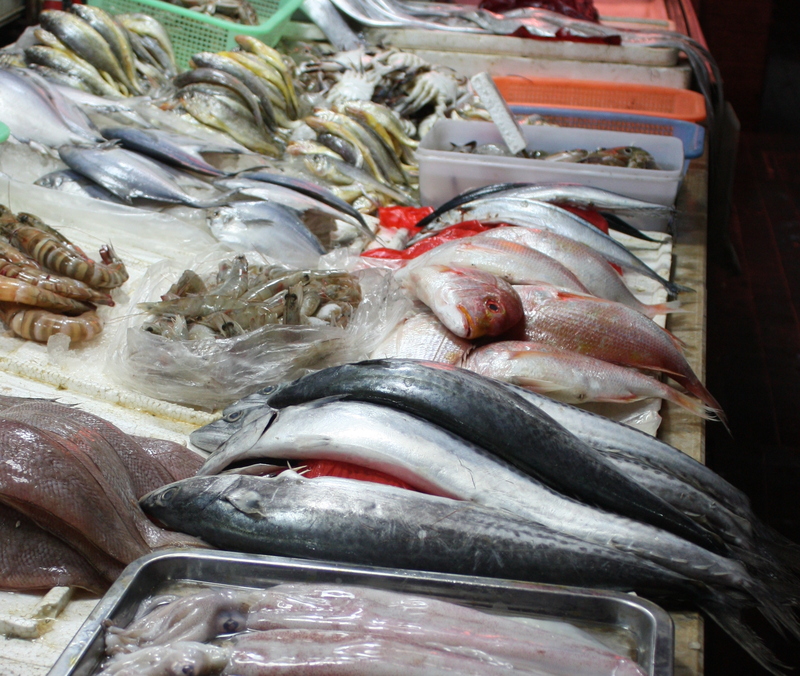 There’s plenty of more traditional seafood here, too. 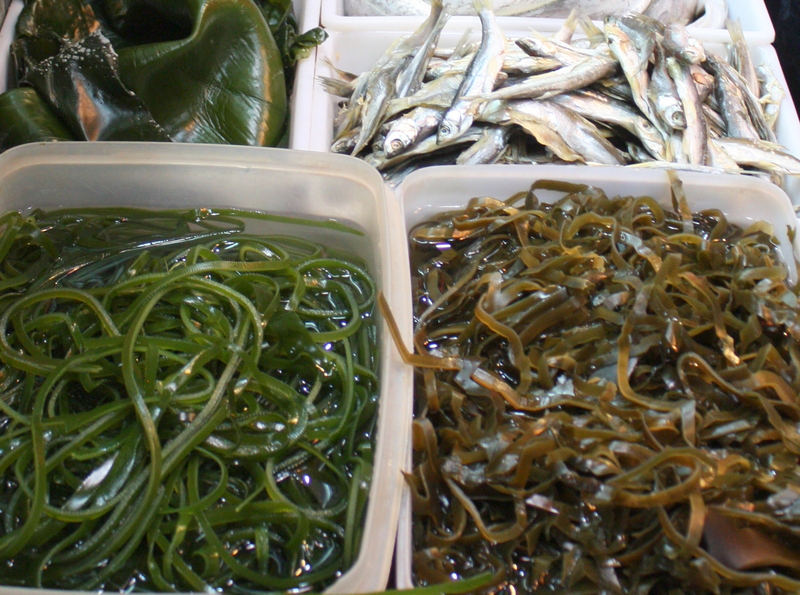 Further on, the seafood become more familiar. 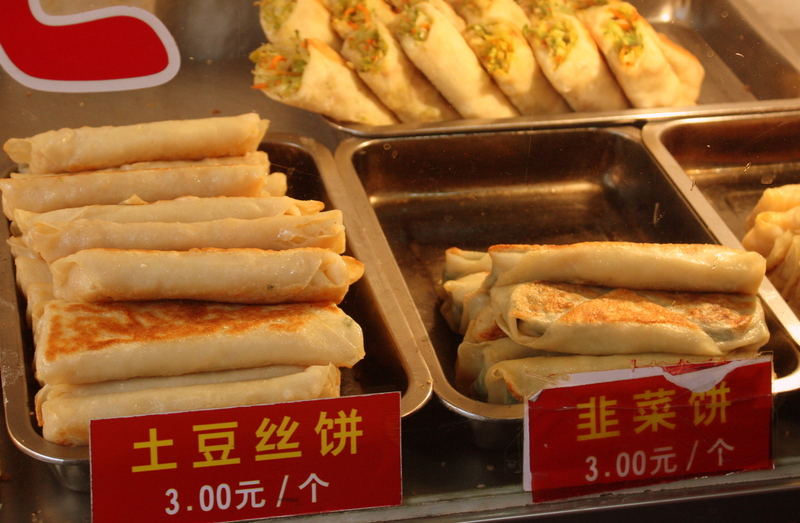 Shanghai cuisine is known for its generous use of seafood. 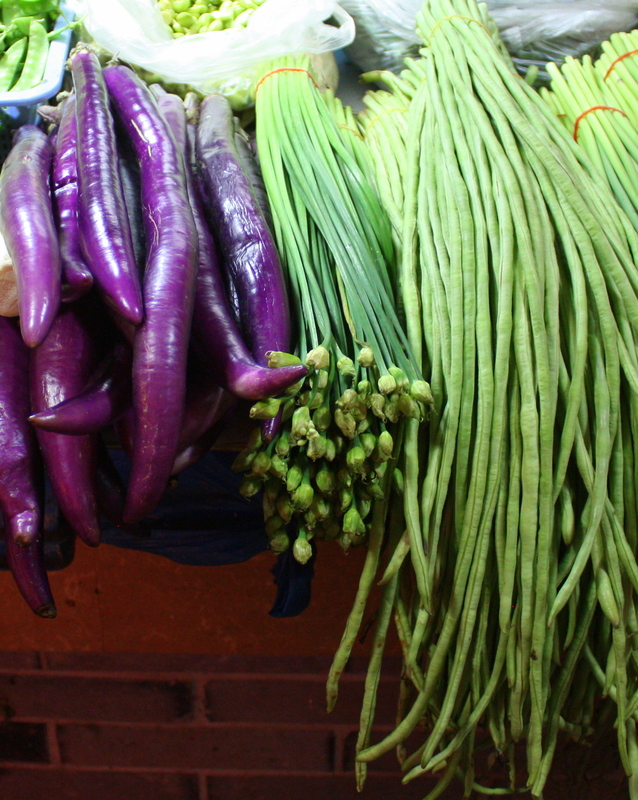 Chinese eggplant and “long beans” dwarf their Western cousins. Although China is the world’s largest pork producer, red meat is conspicuous here largely due to its absence. Soybean curd is an important source of protein here. 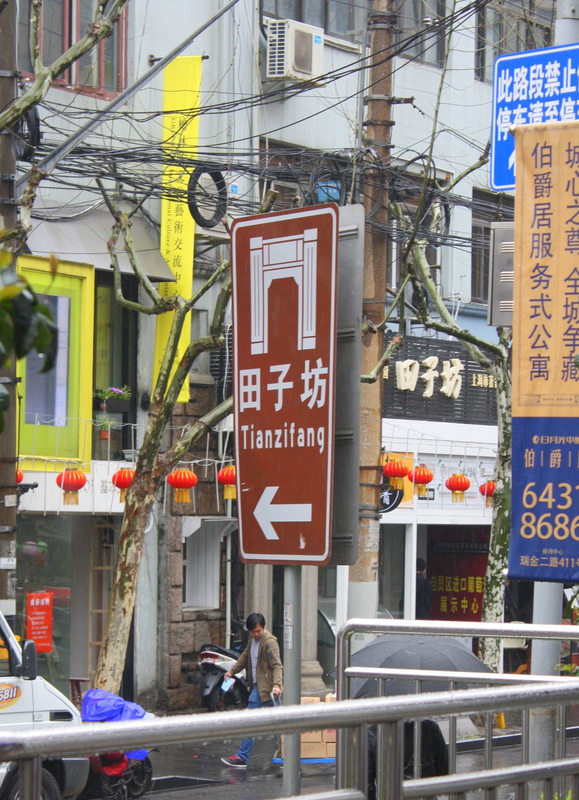 The Taikang Market is often omitted from Tianzifang tours, but it’s a great from-the-ground-up introduction to Chinese cuisine. And the eye candy of this market is at least as satisfying as the neighboring bistros and galleries.